This installment of Purple Duck Games‘ inexpensive pdfs clocks in at 6 pages, 1 page front cover, 1 page SRD, leaving us with 4 pages of content. It should be noted that the content is formatted for digest-size – you can fit 4 pages on a sheet of paper when printing this. Let’s take a look! We begin with the extremely potent (over 3K price) circle of the sage sentinel – it may only be used by someone with a trait, ability etc. that grants a bonus to saves vs. fear or immunity to fear, The ring nets the benefits of mage armor, overland flight at will and several X/day abilities, ranging from 10/day magic missile to 1/day crushing/grasping/forceful hand – as a minor complaint: Their activation could be clearer – I assume defaults, but one could argue otherwise. The ring requires that the wearer swears anew to uphold the ideals of justice each day, charging the ring with light – yep, this is a variant of the Green lantern ring. Fans of Star Trek will enjoy the decoder ring and Grimm rings allow for the use of elemental body III. Jungle rings duplicate the gorilla form of beast shape II, while the signet of the legion Aeris nets constant fly, a bonus to Fly-checks and 1/day sending to other wearers of the ring. Twin rings of wonder are tied to one another and only work when used together – kudos for getting the rules right there. Finally, the wardrobe ring can store an outfit and be dressed in it as a swift action – cool! Editing and formatting are very good – I noticed a double “s”-typo, but no serious hiccups. Layout adheres to a printer-friendly 1-column standard. The pdf has rudimentary bookmarks for start and end – kudos. Jacob Blackmon’s rings are solid. 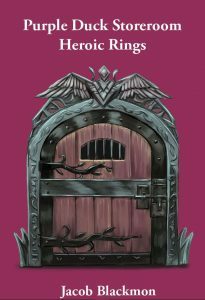 They won’t blow your socks off, but for the low asking price, the pdf is worth checking out if the rings mentioned intrigue you. A nice, unpretentious collection – my final verdict will be 4 stars. You can get this inexpensive collection of rings here on OBS! You can directly support Purple Duck Games here on patreon!